The Federal Bureau of Maritime Casualty Investigation (BSU) registers and investigates all types of marine accidents to or on board German flagged ships world-wide. Within the German territorial waters BSU acts regardless of the flag(s) of the ship(s) involved. List of the Classification Societies with website' Links. This section of the site is devoted to mishaps which have caused damage to the main engine and related pieces of equipment. Accidents don't just happen - they are caused! Electrical blackout and subsequent grounding of the container vessel Clonlee. Know Your Systems Back to Black. Grounding after main engine shut down. Auxiliary boiler explosion on board Saldanha off Newcastle. This investigation reports is not very interesting from technical point of view. But it is very important information regarding to ship's main machinery operating procedures. At 0110 on 16 March 2011, the Isle of Man registered feeder container vessel Clonlee suffered an electrical blackout as she entered the Port of Tyne, England. The ship's engineers were unable to restore the ship's power immediately and the vessel ran aground on Little Haven Beach at about 6 to 7 knots. The grounding caused no injuries and the vessel's hull remained intact. The probable cause of the electrical power failure was an intermittent electrical fault within the shipвЂ™s electrical power supply and distribution systems. Clonlee ran aground because the power failure occurred within the confined waters of the harbour entrance and the master was unable to stop the vessel. The ship critical systems had not been operated, tested or maintained in accordance with the manufacturers instructions or the requirements of the International Safety Management (ISM) Code. Copies of the manufacturer manuals for the electrical power supply and distribution systems were not held on board Clonlee because the shipвЂ™s owners had not translated them into the ship working language. The ship's machinery had not been prepared for manoeuvring and the deck crew were not standing by prior to entering the harbour. The two-man bridge team was under-resourced to respond to the emergency situation. The master was cognitively overloaded and lost his situational awareness. The lack of emergency preparedness and effective training drills led to a total breakdown of internal communications, which resulted in the failure to вЂ?let goвЂ™ an anchor and prevented a full damage assessment being carried out. ShipвЂ™s main machinery operating procedures. the first priority must be to prevent the situation from getting worse. A ferry was sailing through the night when the duty engineer noticed an alarm indicating low compressed air pressure. He went to investigate and found that both main air compressors were running, but the air receivers were empty. The discharge pipe from one of the compressors had sheared, and because of the way the system was designed he could not isolate the leak. The duty engineer tried to make a repair, but had to stop after 30 minutes to respond to a high water temperature alarm on the main engines. The duty engineer called for help and the chief engineer and first engineer came down immediately. Unfortunately, by this time the air had gone from the control system and both main engines stopped. The shaft generators came off load as the shafts stopped, and there was no air left to start the main generators. The emergency generator started, but did not run for long because its ventilation openings were left shut, causing it to overheat. Fortunately the ferry was in open sea and in no immediate danger. Nevertheless, the owners called a tug to stand by while repairs were carried out. During the time the engineers took to repair the air system, the fuel for the main engines had gone cold. Consequently, the passengers spent nearly 2 hours in the dark before the engineers got the main generators started. The ferry finally got underway again 5 hours after the duty engineer first noticed the low pressure alarm. 1. Ask for help promptly. When machinery breaks down, the first priority must be to prevent the situation from getting worse. This can be very hard to do if you are on your own, particularly if you then get involved in repairs. 2. It is essential to understand how the machinery systems depend on one another and then think ahead to prevent damage and make recovery easier. In this case, loss of starting air also led to loss of the main engine control system, a high temperature alarm and the engines shutting down. This might have been avoided if the link had been appreciated early on. 3. More advanced systems may cost extra, but a few additional valves to isolate systems or bypass leaks can be worth considerably more during an emergency. 4. Take time to check that emergency generators and fire pumps are going to run properly. You never know when you might need them. More accidents and safety lessons learned in "MAIB Safety Digest. Part 1 Merchant Vessels." - published 1 April 2011. Editor's note: For safety and efficiency in the operation, servicing and maintenance of shipboard equipment and machinery, it is essential that the instructions and specifications given in the makers' manuals are strictly followed. As it may be impractical for the PMS to reproduce the information from these manuals in their entirety, mariners must familiarize themselves with these manuals when joining ship and consult them again before planning any work. Photocopies of relevant extracts from the manuals are very useful at the job site. When moving from one river berth to another one up-river, with a pilot on board, the high differential pressure alarm across the main propeller shaft clutch control oil filter was activated. Immediately, the chief engineer ordered the engineer on duty to bypass the filter. The engineer did not acknowledge the order and, approaching the duplex lubricating oil filter, wrongly operated the three-way valve, completely stopping the lubricating oil flow. As a result, the main engine shut down automatically on a critical alarm condition. Having lost control, and despite letting go one anchor, the vessel grounded on a river bank. Propulsion was restored soon afterwards and the vessel refloated under her own power with tug assistance and proceeded to moor to lay-by buoys. Fortunately, subsequent survey of underwater hull by a diver and internal inspection of bottom and peak tanks did not show any damage. Vessel on a loaded passage in heavy weather suddenly experienced heavy leakage of stern tube lubricating oil from the forward gland into the engine room bilges. Before any damage was caused to the stern tube bearings and seals, the engine was quickly stopped and on investigation, it was noticed that the rotating seal gland (colored components in Figure) had moved out by more than 60 mm. The rotating gland is held in place by a two-piece clamp ring (shaded in blue) that is tightly mounted on the tail shaft and is also connected to the bush (shaded in yellow) by means of bolts (shaded in purple), maintaining the forward seal gland in position. 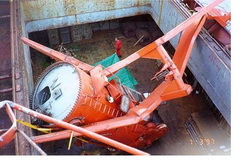 Fortunately, the ship's staff managed to re-position the bush and clamp ring correctly and the vessel resumed the passage without further problems. It was concluded that after the last tail end shaft and docking survey two months ago, the shipyard staff had failed to fully tighten the bolts of the two-piece clamp ring (shaded in red) on the tail shaft, which resulted in the clamp ring along with the gland bush moving out of position over a period of time. 2. After major surveys/maintenance, it must be ensured that all components are re-assembled and tightened to proper specifications. See big dimensioned sketch and Read Report in PDF format. On 18 November 2008, while the Maltese registered bulk carrier Saldanha was anchored off Newcastle, NSW, a shipвЂ™s engineer was burned when the auxiliary boiler furnace вЂ?flashed backвЂ™ during a routine boiler oil firing unit burner exchange. The ATSB investigation into the incident found that the shipвЂ™s crew were not aware of all of the hazards associated with maintaining the boiler burner; were not aware of previous flashbacks involving similar burners; and were not aware of the appropriate first aid treatment required for burn injuries. The investigation also found that the safety bulletin that had been previously issued by the manufacturer did not inform operators that the oil firing unit could be modified. The ATSB has acknowledged the proactive safety action taken by the responsible organisations in relation to the identified safety issues. The ATSB has also issued one safety recommendation and one safety advisory notice. At about 1315, the duty oiler informed third engineer that the auxiliary boiler had just alarmed as a result of a burner misfire. The third engineer thought that the boiler burner was probably dirty and would need to be replaced with the clean spare unit. At 1530, the third engineer prepared the tools he would need. He also put on a pair of leather gloves and safety goggles. The boiler burner was still firing, so the third engineer changed it over to diesel oil so that the heavy fuel oil would be flushed through the fuel lines. He then waited until the burner automatically cut out when the boiler pressure reached 6.9 bar. The boiler furnace was then automatically purged by the forced draft fan for 1 minute as part of the shutdown process. When the purge cycle had completed, the third engineer switched the boiler control select switch to the вЂ?offвЂ™ position and closed the fuel oil supply valves. The third engineer opened the oil firing unit maintenance cover and disconnected the ignition electrode cables. He then loosened the three fuel pipe connections on the atomiser block and a small amount of fuel drained from the fuel lines. A few seconds later, at 1606, while the third engineer was pushing on the burner to disconnect it from the fuel lines, there was an explosion (flashback) from the boiler furnace. The flames from the flashback briefly engulfed the third engineer, who turned and ran from the boiler, covering his face with his hands. The flames also set off the engine room fire alarm. The third engineer checked around the boiler, looking for signs of fire. When he saw that there was no fire, he refitted the maintenance cover and then ran to the engine control room for help. Read Volcano Company Safety Bulletin "Safety Precaution of Volcano gun type burner Type VJ installed on your auxiliary boiler." At 0426 (UTC+1) on 23 September 2010, the cruise liner RMS Queen Mary 2 was approaching Barcelona when one of 12 capacitors in a harmonic filter1 failed, accompanied by a loud explosion. The explosion resulted in extensive damage to the surrounding electric panels and caused the vessel to black out. There were no navigational hazards nearby, main power was restored at 0455 and the ship was able to get back underway at 0523. The harmonic filter was connected directly to 11kV bus bars and was located in a compartment within the aft main switchboard room. 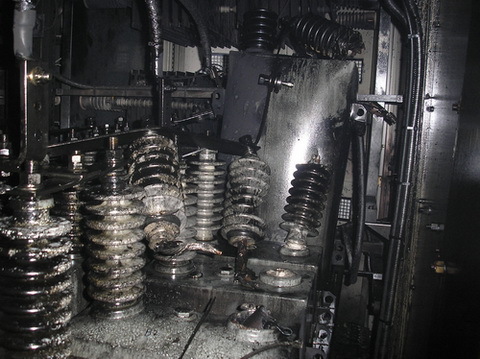 The blast forced the steel door to the compartment out through its frame and also caused serious damage to an adjoining steel door into the main switchboard room. The stiffeners on the bulkhead of the compartment were buckled and the steel cover plate on a cross-flooding duct was blown out into the main switchboard room. Fortunately there were no personnel in the vicinity. The steel casing of another capacitor in the same group was found to have bulged severely and was possibly on the verge of failure. There was evidence of smoke and heat in the compartment (Figure 4), and any fire was probably extinguished by water from the hi-fog system. Two hi-fog outlets, one in the harmonic filter compartment and the other in the main switchboard room, were activated in the wake of the blast. The accident is described in MAIB SAFETY BULLETIN 4/2010. This document, containing safety lessons, has been produced for marine safety purposes. Read MAIB SAFETY BULLETIN 4/2010. Savannah Express had suffered an engine failure earlier that morning as she approached the Nab Tower and the pilotage boarding area. She anchored and carried out repairs before proceeding to Southampton. The pilot was aware the engine had been turned before leaving the anchorage, but he was unaware that the engine had only been turned on air astern. Over an hour after leaving the anchorage, the pilot was informed that the cause of the engine failure had not been positively diagnosed, but no additional precautions were put in place and the harbour authority was not told. design without the normal camshaft and mechanical timing gear. This equipment had been replaced with a computer controlled electro-hydraulic system. The system had suffered a number of technical problems since Savannah Express had left the builderвЂ™s yard in Korea in April 2005. At Singapore, the previous port of call, a service engineer from the engine manufacturer had attended the vessel to rectify various guarantee claims. In addition, three out of the four pressure sensors on the hydraulic system had failed during the preceding 2 months, but the service engineer was unable to provide any spares, due to a problem with supply. The chief engineer received the impression that the sensors were used for pressure indication only, and that the loss of the final sensor would not cause the engine to stop. As a consequence of this erroneous information, the chief engineer informed the master that he was content for the vessel to sail with only one sensor working. Read Report on the investigation of the engine 12K98ME failure of Savannah Express. A small container ship had problems with its main engine driven lubricating oil system since construction. There were three separate failures of the two lubricating oil pumps. In each incident, one of the lubricating oil pumps failed catastrophically. The principal damage caused was the failure of a number of the connecting rod bottom end bearings. After each failure a large amount of both fine and coarse metal debris was found in the oil filtration system. LloydвЂ™s Register Technical Investigations (TI) was asked to attend the vessel to investigate and advise. Read more in the fourth issue of Technical Matters, a LloydвЂ™s Register publication containing case studies covering technical issues and their solutions. On 7 March 1997, the Polish flag general cargo vessel Lodz 2 was lying at no. 24 berth, Victoria Dock, Melbourne. Using one of the its own cranes, the ship was discharging a general cargo of steel products, including bundles of steel pipes, from no. 2 hold and tweendeck. At about 0740, the sixth load of steel pipes, for that morning, was being discharged onto the wharf by no.1 crane, a 12.5 tonne capacity crane situated on the aft end of the forecastle on the shipвЂ™s centreline. The crane was being driven by one of the waterside workers. The load, weighing approximately 8.6 tonnes, consisted of 18 lengths with diameters varying up to 273 mm. As the load reached the side of the ship, there was a violent jolt and a bang as the slew bearing failed, then the crane fell from its pedestal into the port tweendeck of no. 2 hold. The jib struck the port bulwark, setting it down and out from the shipвЂ™s side, while the body of the crane hit the inboard edge of the port hatch coaming, before rotating through 180В° and finishing up, upside-down, in the tweendeck. The driver was able to climb out through one of the broken cab windows and up the ladders, out of the tweendeck to the main deck, before the effects of shock caught up with him. He had fallen, in the cab of the crane, approximately 17 metres into the tweendeck from the craneвЂ™s position on its pedestal. An ambulance was called and the crane driver and a waterside worker acting as the hatchman, also suffering from shock, were taken to a medical clinic but were not detained. The crane was severely damaged and the badly twisted jib had to be cut up to remove it from the ship. The incident was investigated by the Marine Incident Investigation Unit under the provisions of the Navigation (Marine Casualty) Regulations. Read Report on the investigation of this failure. Chief Engineer killed after entered into oily bilge tank onboard m.v. "Sago Monal"
Report of Investigation into the Engine Room Fire on Board M.V. вЂњFleet Trader 1вЂќ Causing One Fatality on 24 March 2005.